Why is Suleyman Shah's tomb so important? Scores of Turkish troops and vehicles have entered Syria to evacuate and destroy a mausoleum where a forefather of the Ottoman empire was buried. The BBC's Matthew Davis considers why the site was so important. The now ruined tomb of Suleyman Shah stands on a football pitch-sized spit of Turkish land inside Syria, but its historical and political significance belie this humble geography. Shah was a Turkic tribal leader who lived from about 1178 until 1236, when according to an epigraph in his mausoleum he "drowned in the Euphrates along with two of his men, in search for a home for himself and his people". Official accounts are questioned by some, but the story goes that Shah's followers headed north into modern-day Turkey. It was there that his grandson, Osman I, founded the Ottoman Empire, which at the height of its powers centuries later controlled swathes of territory across south-east Europe, the Middle East and North Africa from its capital in Constantinople (now Istanbul). The Ottoman empire had disintegrated by the early 20th Century, and the new state of Turkey emerged - but such was the national importance of Shah's burial complex that the site was protected under a 1921 agreement with France, which then occupied the area now located in Syria's Aleppo province. Since then, Turkey has invoked its right to station troops there and fly its flag over the site, which was relocated some 80km (50 miles) to the north when the original area was flooded by the creation of the reservoir Lake Assad in 1974. Turkey's only foreign enclave has retained immense emotional value for its people, but the chaos engulfing Syria in recent years has seen it assume a growing political significance. In August 2012 President Recep Tayyip Erdogan - then prime minister - warned all parties in the Syrian conflict that an action against the tomb would be considered an attack on Turkish territory "as well an attack on Nato land". And amid reports that the soldiers stationed there had been besieged for months by Islamic State militants, last year the Turkish parliament authorised the use of force against the jihadists. However despite recently joining the US in training some rebels fighting Syrian President Bashar Assad, Turkey has resisted playing a full role in the US-led campaign against Islamic State. Correspondents say that if the historic Suleyman Shah tomb had come under attack, the effect on public opinion would have made it harder for Turkey to avoid a full-scale military campaign against the group. So the fact that the tomb is now moved and the Turkish soldiers evacuated is a great relief for the nation and its leaders, local commentators say. "We had given the Turkish armed forces a directive to protect our spiritual values and the safety of our armed forces personnel," Prime Minister Ahmet Davutoglu said after Saturday's operation. 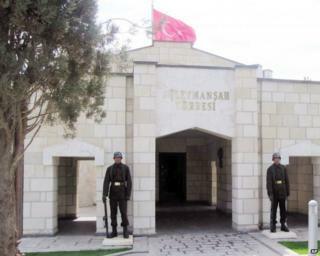 Turkish media later showed images of three soldiers raising the flag at a new site closer to the Turkish border, which is likely to host a new tomb that authorities hope will provide a final home for Suleyman Shah.